and never-ending love. And to celebrate this sweet day we have brought you this healthy, sweet dessert shots. 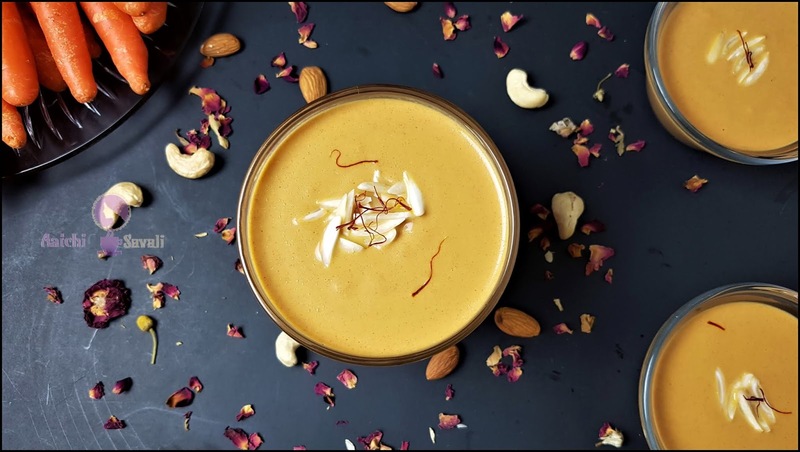 It's exploding with crunchy carrot’s goodness, blended dates, and nuts and topped with sliced almonds, saffron strands, and rose petals. So why not serve it on Valentine's day? This healthy version of dessert shots is prepared with the creamy carrot pudding and delicious carrot halwa. 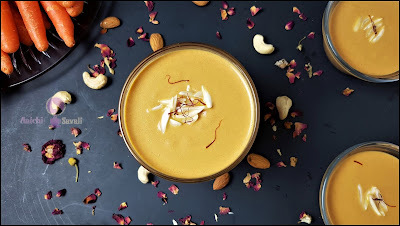 This dessert shots are a significant dessert trend nowadays and is ready in about 25-30 minutes in instant pot and is easy to prepare and it's undoubtedly one of the most delicious desserts we love lately. 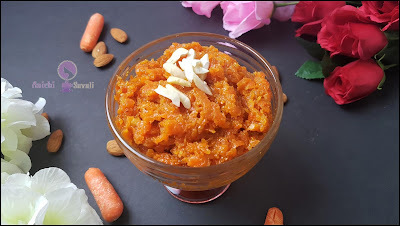 Simply bursting with the flavors of rich, crunchy and creamy carrots and healthy nuts! 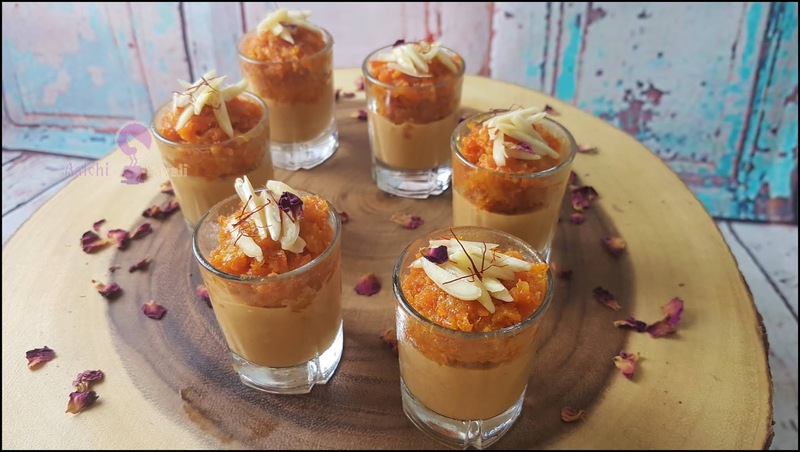 These moist, crunchy and gluten-free carrot dessert shots are unbelievably good, and they are everything you want in a Dessert and more. They are packed full of flavors. To make base Layer(Carrot Pudding) vegan you can use coconut milk and vegan butter, and that will work well too! Here, I have simplified the procedure and made this recipe a one-pot recipe. So guys give this a try! Preparation Time: 15 Minutes; Cooking Time: 20 Minutes. Each Carrot Dessert Shots Contains 90 Calories. Turn on Instant Pot and add 1 glass of water to the pot and place carrot milk mixture pan with trivet. NPR for 5 minutes and release remaining pressure manually and let it cool completely before blending. Add remaining milk, cover and cook for 2-3 minutes or until it boils. Here, carrot pudding is ready to set our base layer or 1st layer. 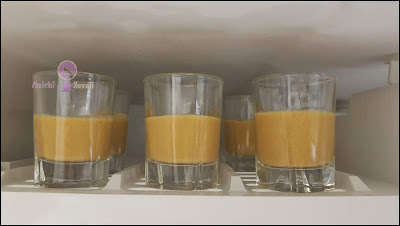 Layer dessert shot glasses with prepared Carrot pudding (add 1-2 Tbsp pudding into each glass). Freeze it for 10-15 or until it set. Turn on saute mode of instant pot and add vegan butter, grated carrots and saute them for 2-3 minutes. Add coconut milk and close the lid and place vent to sealing position. Cook on Manual more(Hi) for 3 minutes. Open the lid and add almond flour, cardamom powder, and sugar and mix all well. Turn Instant Pot to Saute mode and cook carrots till the liquid gets evaporated it will take 5-6 minutes. Here, carrot halwa or our top layer is ready to set. Take out the shot glasses from the freeze. 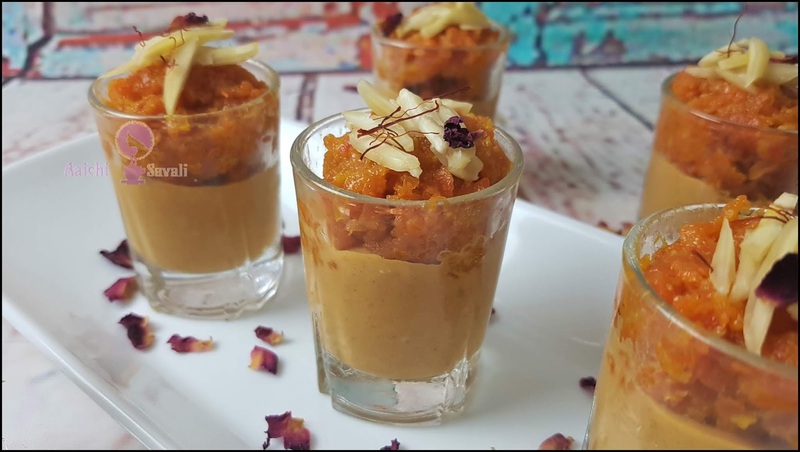 Layer dessert shot glasses with prepared carrot halwa (add 1-2 Tbsp halwa into each glass). Garnish with sliced almonds, saffron strands, and rose petals. Tadaa, delicious Carrot Dessert Shots are ready to serve. Simply chill in the fridge, take out from the refrigerator before serving and ready to enjoy!!! Calorie count is based on a 2000 calorie diet. Per serving contains 90 calories, along with 13.48 g carbohydrates, 3.64 g fats, and 1.6 g protein. It is good to eat carrot dessert shots as a dessert. You are most welcome Mathew D. Do try it and let me know how you like it.